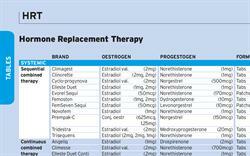 Quickly compare HRT preparations with the MIMS HRT table. View available HRT products by type, including sequential and continuous combined preparations, as well as unopposed oestrogens, adjunctive progestogens, local oestrogen-only preparations and the newer tissue-selective oestrogen complex. Hormone doses are provided for the oestrogen content (whether as estradiol, conjugated oestrogens, or another form) and/or the progestogen component (including norethisterone, norgestrel, dydrogesterone, levonorgestrel and medroxyprogesterone). Formulation details are specified to assist prescribers in choosing an appropriate product; the table includes tablets, patches, gels and vaginally administered preparations (such as the ring, creams and tablets). Bleed characteristics for each product are noted as monthly (M); quarterly (Q) or no bleed (X). Finally, the table allows easy comparison of cost considerations when prescribing, with details of the cost per 28 days based on the NHS list price. 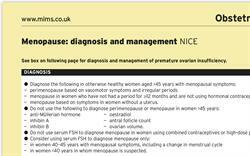 Brand names link through to the full MIMS entries for more detailed prescribing information on each product.